The United Bank for Africa Plc (UBA) has invited qualified Persons to visit the UBA recruitment portal 2019 and fill the online application form in order to Apply for the current Bank Job vacancies in Nigeria at UBA. 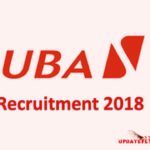 So Graduates that have been looking forward to seeing the Banks currently recruiting in Nigeria or Bank Job vacancies in Nigeria can now Apply for this UBA recruitment 2019/2020 so the can pass through the UBA recruitment process and finally get these Banking Trainee Jobs in Abuja, Enugu, Kaduna, Lagos, Rivers (PH). Concerned Graduates should note that participating in this UBA Banking Trainee Recruitment 2019 is certainly the best way to start their career in the Banking and Finance field. UBA ensures that her employees have a non-threatening work environment that enables workers that are very effective to be rewarded. A Staff of the United Bank for Africa Plc (UBA) told the Apply for a Job team that the Bank gave him to the opportunity to grow by offering a wide range of training, ranging from banking to personal career development. Because the UBA Bank is very good in mobile banking, she gives her workers excellent mobile banking training to enable them to help the Financial Institution maintain their current status. Interested Persons should possess a minimum of Ordinary National Diploma (OND) before Applying to pass through the UBA recruitment process. Only People that are not more than 27 years old are welcomed to visit the UBA recruitment portal 2019 to Apply online. Candidates should have the zeal to do Banking Jobs with modern technological facilities. Applications from Persons that obtained their O’level qualification from NABTEB will not be considered for UBA recruitment process for Banking Trainees. Anyone that have been trying to see the details of the UBA teller recruitment, Banks currently recruiting in Nigeria, Bank Job in Abuja, UBA Graduate Trainee recruitment 2019 or the UBA recruitment portal 2019 is welcomed to Apply for this Banking Trainee recruitment at UBA. However, the must possess excellent customer service skills. Interested and Qualified Individuals should visit the UBA recruitment portal here: uba.jb.skillsmapafrica.com to get more detailed information and Apply online. I will love to be one of the staffs in UBA BANK, one if the Africa fastest growing bank.